If you are looking to purchase new training tables for your business, look no further than ROF to satisfy your needs. We specialize in superior quality office furniture, and we have a selection of training tables sure to please you at a price that won’t break the bank. Located in Tampa, Florida, near the Port of Tampa and Tampa International Airport, ROF can quickly ship your order right after you place it. We have our own fleet of moving trucks and a team of moving experts that can deliver your furniture directly to your office. You’ll be happy to know that no piece of training room furniture leaves our 120,000-square-foot facility for shipment without first undergoing an inspection to ensure that it leaves looking clean and functioning as it should. Whether you need a computer training table or a semicircle training table, trust ROF to help you find a table for you. Contact ROF today to receive more information about the new and used computer training tables we currently have for sale. 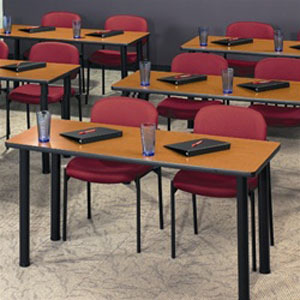 Description: Vector Training Tables are mobile, compact, and versatile. Includes modesty panel, under-surface book rack storage, and locking casters. With a one-button flip mechanism tables fold up and can be nested into each other.